Forest City Fashionista: The Manhattan Vintage Show - The People! Maureen from Daybreak Vintage - I love her entire look, and it was nice to see someone else wearing platform boots besides me! The young woman in head-to-toe red is Caroline Quinn, proprietor of the vintage boutique Dirty Fabulous, in Dublin Ireland, which is the most awesome name for a vintage boutique ever. I met my adorable hair twin, Kendra Joseph, who is a makeup artist, last year at the Vintage Show, and I had been in this year's show maybe 5 minutes when we spotted each other, which led to many squeals of joy and hugs! 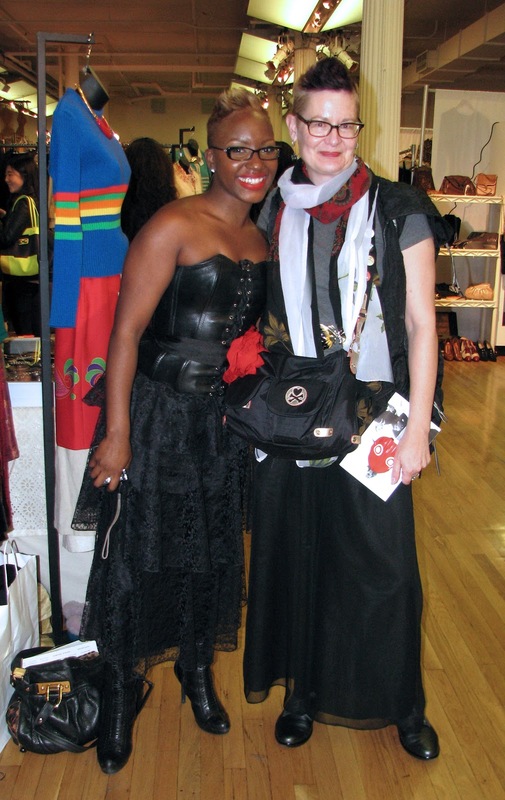 After we got caught up and took some photos we went on our separate ways and later that day I ran into her trying on hats at David Owen's booth where she purchased a sassy little black one with a red feather that matched her fab leather and lace outfit perfectly. 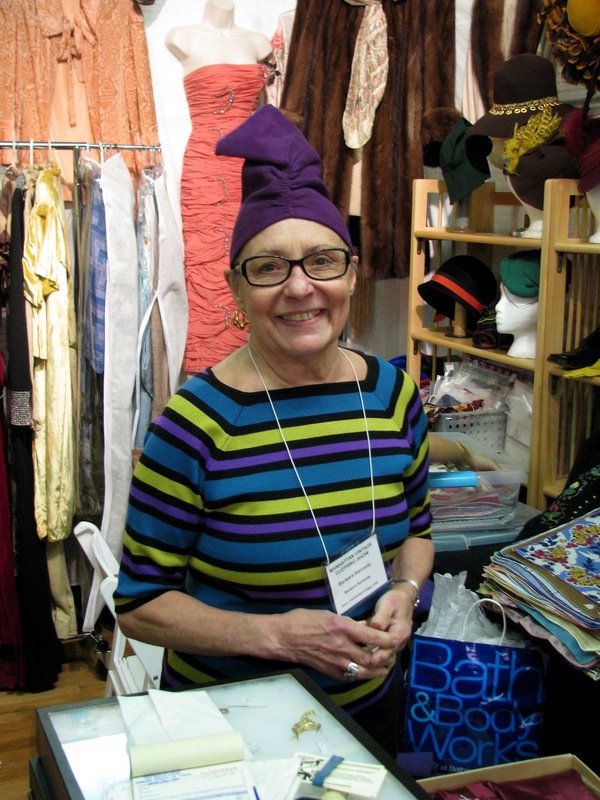 Barbara Kennedy not only was selling the most fabulous hats, but she was wearing this delightful purple one that matched her vibrant striped top. I was perusing some of the treasures at the show with Jean, half of The Idiosyncratic Fashionistas when we ran into Tziporah Salamon in one of her gorgeous Asian-inspired outfits. She would have coordinated perfectly with Hamish Bowles. The man with her was also working at her booth, and I apologize for not getting his name, but he looked great in his monochrome casual-but-stylish oufit. This delightful woman clearly loves patterns and colours. I particularly liked her flowered shoes. One of my favourite vendor outfits - I was particularly enamoured with the sock garters and co-ordinating, but not matching, socks. 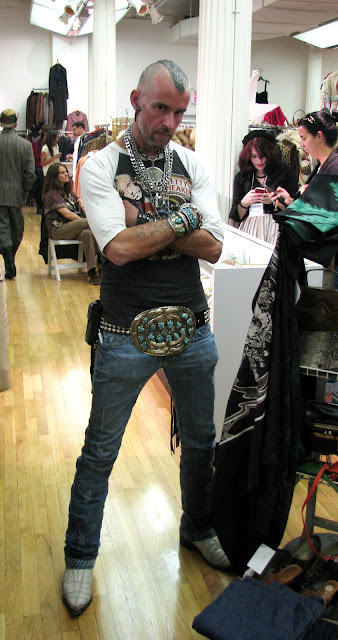 This nattily-attired gent was working at Noble Savage Vintage. 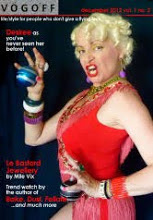 Heather Ramey, proprietor of Noble Savage Vintage - gorgeous hair cut and colour! Both days of the show we stopped to chat with Fillipo Gurrieri, co-owner of Sunset Blvd. 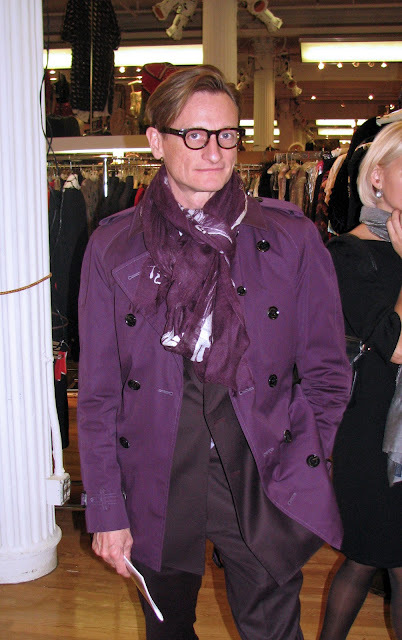 Vintage, and a man possessed of a very sharp sartorial flair. 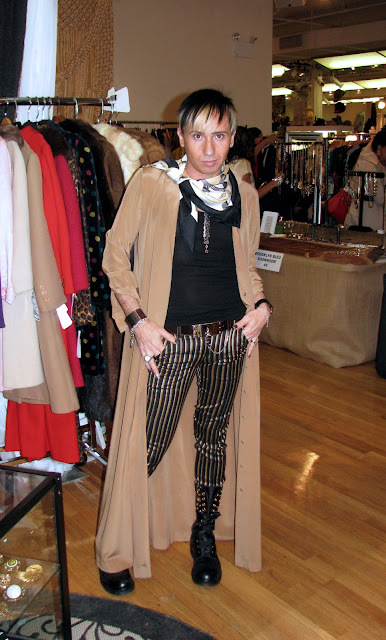 Valerie (of the IF's) purchased her polka-dot coat (you can see it hanging on the rack behind him) from his booth. I had a wonderful conversation with this young woman with the funky two-level hair. 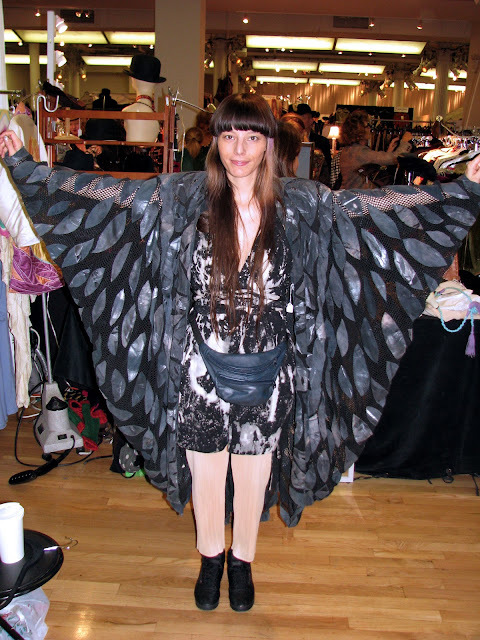 She was trying on this unique leather and mesh cape and I loved the way it made her look like an exotic bird. I ran into Martha several times during the course of Day 1 of the show, and each time I noticed a new detail of her marvelous outfit, such as the cheerful yellow bakelite accessories. Very few people can carry off a head-to-toe vintage ensemble without it straying into the territory of "costume", but Martha wears it so well, and somehow makes it look modern. As the last day of the show drew to a close, my fellow partners-in-style-crime and I forced ourselves out the door of the Metropolitan Pavilion back out into the world. 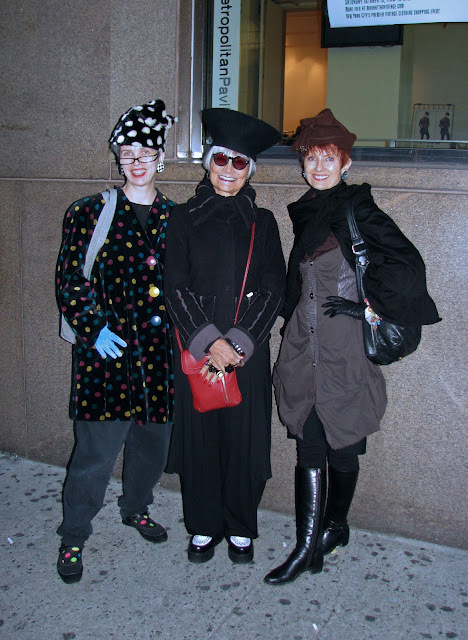 Judith, The Style Crone, (far right) is wearing a dress and hat she purchased at the show, Valerie (far left) is wearing the marvelous polka dot coat she found at Sunset Blvd. 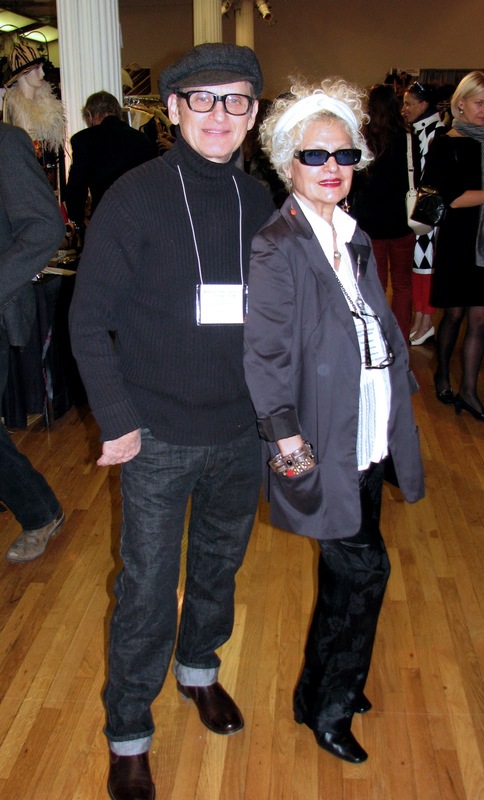 Vintage, and Jean is wearing the architectural Donna Karan hat that was her score of the day. Judith and I were heading off to have dinner, and I was forced to say goodbye to The Idiosyncratic Fashionistas. Thanks, and hugs, to all of wonderful people who made my weekend in New York an adventure to remember! Wow, what a weekend that was! 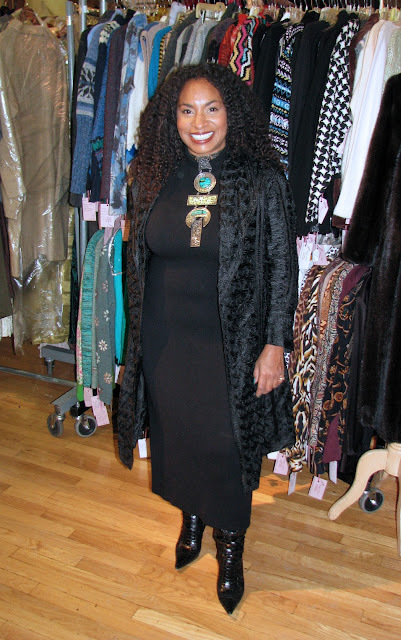 Thanks for sharing it and allowing me a glimpse into the fabulous vintage world of Manhattan! Maybe someday I'll be able to go. 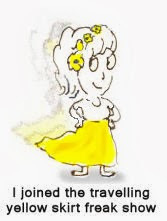 Until then, I'll rely on you and the other wonderful blogging fashionistas to keep me posted. Thanks for the incredible rogues' gallery - oh such fabulous creatures all! 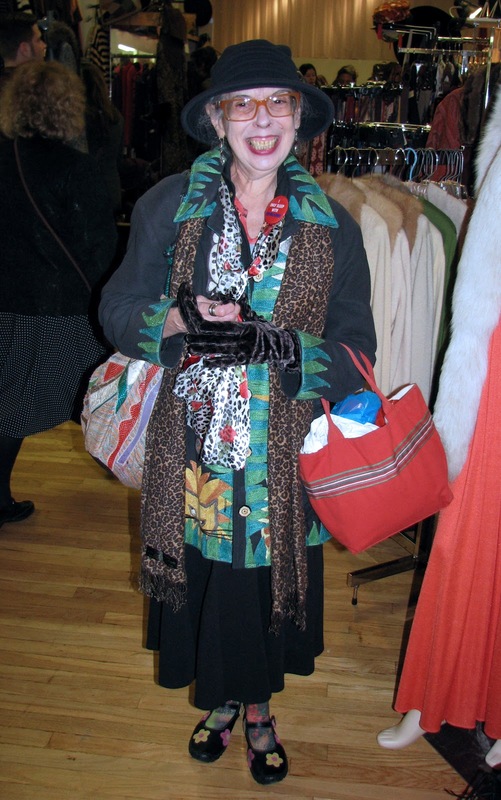 Shelley, this post if filled with stellar photos and commentary and I'm living the Manhattan Vintage Show all over again. You are the photographer extraordinaire and you are making me smile as I sit here on a Sunday afternoon. It was so much fun to meet you and spend time with you in NY! How fortunate I was to be in on this adventure! Until the next time! Wow, what a visual FEAST of beauty!! 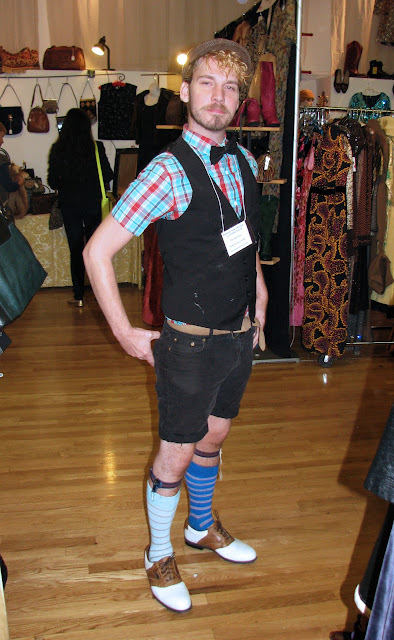 I so much love seeing people express themselves in creative dressings. Especially when guys do it too. Life is so short and dressing to ones own pleasure is so important really. It's more than just a visual show. It's a celebration in confidence and individuality. Thanks for sharing these! It was great to meet you and now I can get to know your wonderful blog. I continue to be impressed by the visual feast of this event. Stu's belt buckle looks like a hub cap! Oh my, what an eclectic group of people. I would love to have been there! I love your style as well Shelley very, very stylish and cool you rock girl! Thank you so much for my wonderful vicarious visit!! 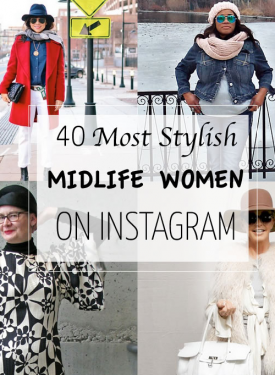 You captured so many amazing people, showcasing such great individual style. I loved the photo of you with your hair-twin. Maku elämyksellistä elämää rakastua väreistä väreihin ! Oh my dear, this is certainly a post of all posts!!! Thank you so much for sharing your spectacular adventure! 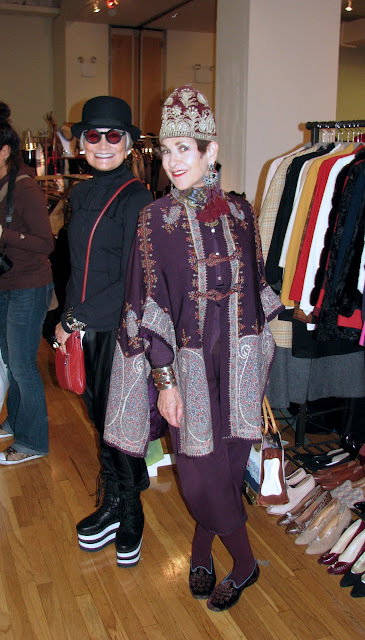 I will be back many times to truly take this all in...I am in awe as much from the uber stylish people and clothes you documented as much as the wonderful women who accompanied you on your vintage journey! The words "time sure flies when you're having fun" were never so true. You hit the town full-tilt and showed the most amazing take-no-prisoners attitude toward having fun. Miss you terribly. We had dinner at Cafeteria this evening and knew you would have loved it. As they say in the south: "Come back soon, y'a hear?"